As your product evolves and changes over time, you’ll invest money and time in new features, big product launches and expensive release cycles. Despite this, the vast majority of new features flop – because they never get used. Fun fact: when Microsoft asked their users what they wanted added to Office, they found 90% of the requested features were already there. They had just done a terrible job of customer onboarding – making sure their existing users were kept up-to-speed on the software. 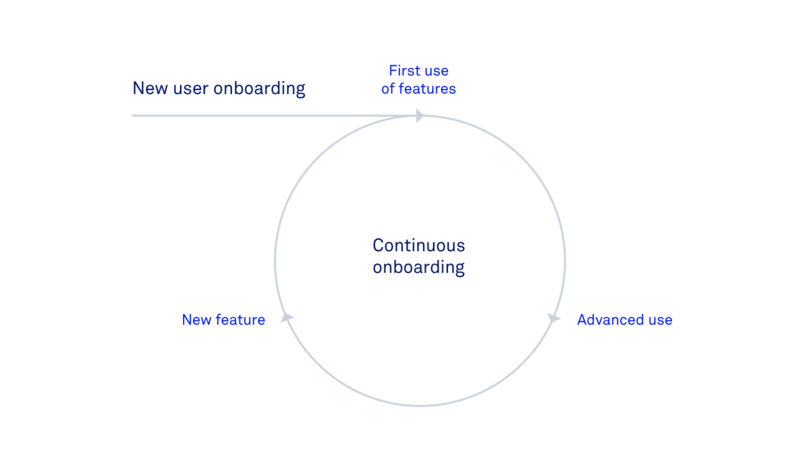 Customer onboarding is the continuous process of first introducing your users to the platform, then connecting them with the right features at the right time. Onboarding is critical throughout a customer’s journey to ensure that they always get the most out of your product — thereby improving retention. Oftentimes when we think about “onboarding” we usually don’t think beyond signup. In reality, your onboarding is just getting started. You haven’t turned users into experts, and they haven’t yet given up all the other products they used before yours. As we discuss in our book, Intercom on Onboarding, if you only focus your customer onboarding efforts on new signups, you’re leaving a massive opportunity on the table – passionate, engaged customers. For example, let’s say somebody has been using your product for six months. They’re totally engaged and up to speed. But then you release a brand new feature that can make them even better. That’s an onboarding opportunity right there. Ultimately, the best onboarding retains customers over time by continually showing them how to get the most out of your product. We experienced this when we launched Smart Campaigns. We knew it had the potential to improve almost all our customers’ definition of success – personal customer communication at scale. This gave us a significant onboarding opportunity – we could deliver more value to our existing customers. The challenge was that Smart Campaigns was not an easy concept to understand. If the beta period taught us one thing, it was that a certain amount of hand-holding was required. The easy path would have been to ignore this and send a once off feature announcement email to all our customers. But that meant we risked it becoming a feature only a few customers ever looked at. That’s why we set out to carefully and consciously onboard existing users to Smart Campaigns. Our approach was to make just enough information available at every turn, but also stay out of the way. Here’s a few ways we did that. It’s a common mistake for companies to launch features in products without any context. Your goal should never be just “get it launched”. Your goal is “get it used”. That’s why the right time to promote an improvement is not only when someone is in your product, but when they’re in a position to use it. Here’s how we built a customer onboard process around this principle. 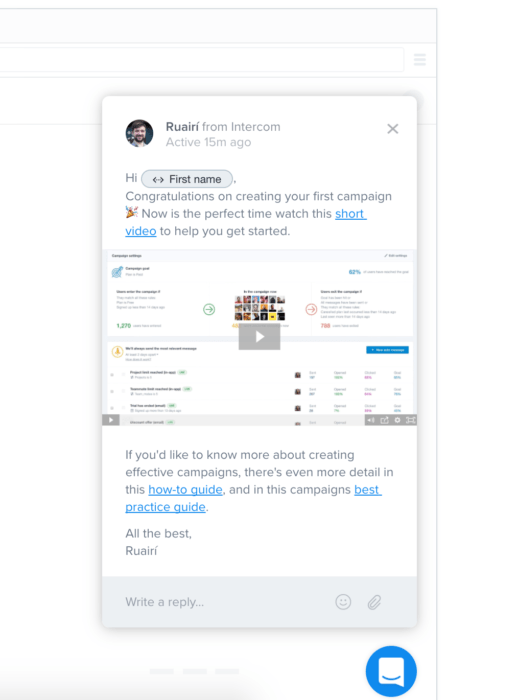 For Smart Campaigns, we announced the new feature to customers when they arrived in the messaging area of Intercom, via an in-app announcement. That message contained a video with a high-level overview of the feature and instructions to get started. Like all good onboarding messaging, it’s closely modeled on just-in-time information – teach in the moment when specific information is actually useful. Not only is it a great way of providing a warm and human experience to your product, it encourages action and tees your customers up for success from the word go. This is a far better approach than saying, “Your campaign is empty and that’s all I’m going to say.” You would never say that in person to your customer, so why say it in your product? When a customer encounters a campaign for the first time, there is an example campaign created when they get there – with best practice tips and links to helpful guides. Then, when a customer creates a new campaign, and sees a blank campaign for the first time, we signpost them to a guide for creating engaging messages. This is easily dismissed, but it’s helpful content in the right place at the right time for those who need it. In education, the more you hold someone’s hand, the less their brain will engage. The same goes for onboarding – if you keep spoonfeeding users solutions, don’t be surprised when they can’t pick up a knife and fork. That’s why it’s better to give information as gradual hints, so new users can more deeply retain what they’ve learned. One of the best ways to do this is to center information around the intent of the customer. For example, when a customer creates a new campaign, by clicking on the create button they’ve shown intent. With new users interested, now is a good time to start sharing more advanced information like best practice guides. This type of careful consideration really does drive engagement. 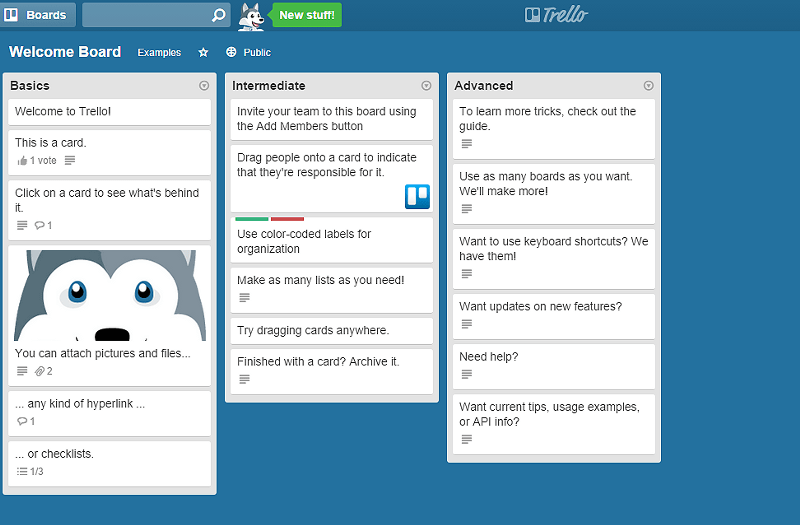 Onboarding users to a new feature requires the same skill as onboarding them to a new product. You wouldn’t welcome new users to your product by asking them to do complex tasks only a pro user would be able to do. So don’t overload users when you’re onboarding them to a new feature either. Think about a game like Super Mario Bros. At any given point, only the necessary parts of the game are on screen, allowing players to gradually and naturally understand what’s going on around them. As you make progress, only the next piece of relevant information is exposed. Imagine you saw the entire level as soon as you started playing? Front loading your users with information will make sure they never get past the first few hurdles. For example, Intercom users don’t need to know about our keyboard shortcuts until they’ve been in the inbox for a while and have started to deal with a heavy load of user conversations. It’s certainly not a day one announcement. Similarly they probably don’t care about our bulk data export feature until they’re tracking a bunch of data. Focus your message on what your users can achieve with this feature and you’ll get their attention. The best way to tell a customer how to do this stuff is after you’ve gathered evidence that they’re a good candidate to hear about it. When you’re building software, remember there are hundreds of products competing for the same job. If you’re not continuously showing your customers how to get value out of your product, you’re not encouraging product dependency. You’re leaving the door open for someone else to come in and persuade them their product is more valuable than yours. That’s why you need to continuously onboard existing customers, bringing people all the way through, and making sure they get as much value as they can.